NC French Teachers - News We are the primary professional association for the teachers of French in the state of North Carolina. Our primary goal is to represent the French language and culture in North America and to encourage the dissemination, both in the schools and in the general public, of knowledge concerning all aspects of the civilization of France and the French-speaking world. You can contact us at any time by sending us a message at ncfrenchteachers@gmail.com. Please join us for a full day of professional development and networking with other French, Portuguese, and Spanish teachers from across the Carolinas! Three language-specific sessions for all levels, coffee and pastries plus lunch are included. You do not have to be a member of AATF or AATSP to attend! Registration begins at 8:30am, with keynote at 9:30. Sessions are from 10:35 to 2:30! Registration fee is $25! 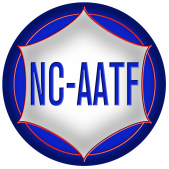 If you register prior to April 1st, you will automatically be entered in a drawing for a free membership to AATF or AATSP! ​A certificate for 5 hours of CEU credit will be available. Click HERE to register for the Joint Spring Conference! ​Proficiency is like a game! There are multiple paths, there are many pawns, and rules and strategies abound. Move forward on the path to proficiency and come experience the Game of Life! Jeannie Starman : Comptines, Chansons, et Poésies: Apprendre en s'amusant! Taking cues from early childhood French favorites, this session will share strategies and extension activities aimed at reducing the elusive affective filter that keeps so many of our students from talking. Come and learn how to incorporate nursery rhymes, simple songs, and poems into any level classroom so that your students are talking, joking, and even singing with confidence in no time! Emily Burrus : It's a Jolly Holiday in French Class! Celebrating holidays is a great way to explore culture. Using resources from the AATF’s Commission for the Promotion of French site, France TV Education, and teacher created resources, walk away from this session with resources you can use in your own classroom and in collaboration with your World Language cohort to bring the fête/fiesta back to your school! Cristy Bohlen : Jammin' with Music on Mondays in the World Language Classroom: Intercultural Communication in Context. Come see how you can immediately increase your learners' knowledge of target language music while leading them to engage in higher-order thinking about their own culture as it compares to the cultures where the language is spoken. With the NCSSFL-ACTFL Can-Do Statements on intercultural communication in mind, participants will learn how to increase student proficiency while enjoying music that appeals to a variety of language students. Links to music resources, presentations on musicians, and tasks that can be used on Monday will be provided. All examples will be in French. Please see the presentation from the Réunion Générale from the Joint Spring Conference AATF-AATSP below!